Activists demanded the release of Crimean residents illegally imprisoned by Russian invaders. 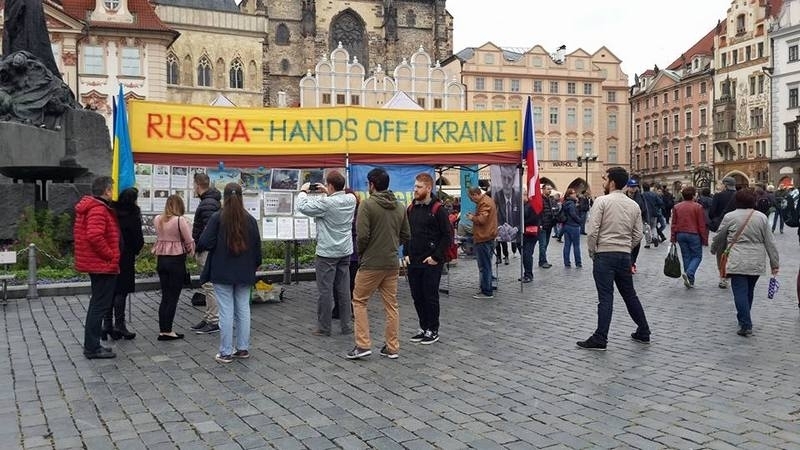 On the Old Town Square in the capital of the Czech Republic, activists of the Prague Maidan group installed stands with portraits and biographies of people imprisoned in Russia or killed for freedom in the Crimea, according to the group's Facebook page. The personalities depicted on the posters are Mustafa Dzhemilev, Ahtem Cheygoz, Oleg Sentsov, Aleksandr Kolchenko as well as the other political prisoners. The participants of the action of solidarity also prepared cartoons about the Russian aggression in Ukraine and the so-called referendum of 2014 in the Crimea on the annexation of the peninsula to Russia. About 30 participants from different countries came to the action, including representatives of Azerbaijan, Israel, Austria, Croatia and England. "Violation of Ukraine's sovereignty in the form of annexation of the Crimea, illegal introduction of Russian troops without identification marks to the East of the country, supplying the separatists in the Donbas with weapons and other means are perceived as a violation of international obligations, peace and stability in Europe," the press release said. Several representatives of the Ukrainian community gathered near the Memorial to the victims of communism with portraits of the Crimeans who are currently in prison because of the criminal cases initiated against them by the Russian authorities. The participants of the event demanded the release of Crimean prisoners. The organizers of the rally noted, that their demands also include an immediate end to the persecution of the Crimean Tatars by Russia. Earlier, In the Krasnogvardeysky area of the annexed Crimea on September 23, Crimean Muslims held a collective prayer (dua) for the cessation of repression on the peninsula.